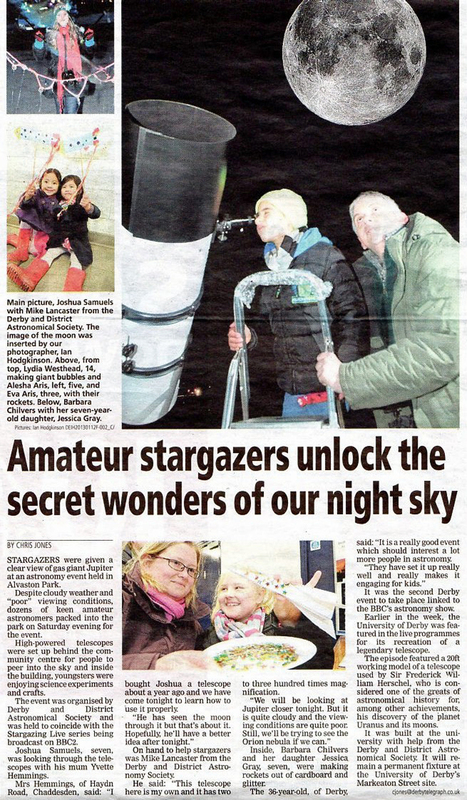 For the second year running the DDAS was invited to bring along telescopes for the Stargazing Live event held at Alvaston Park in Derby on the evening of Saturday 12th January 2013. We brought along a good selection of instruments including among others the Society's 8" LX90 Schmidt-Cassegrain telescope, a 5" Newtonian, an 80mm refractor and a 10" Schmidt-Newtonian. Like the previous year the event was a huge success and this time the skies were considerably clearer. Literally hundreds of people filed past our assembled scopes to catch views of Jupiter and its moons as well as the Orion Nebula. The Society display was once again in a prime position inside the pavilion and manned by Anthony Southwell. Our thanks to those DDAS members who gave their time and braved the cold for at least 4 hours to make this such a success. Thanks also to Katie Smith from the Alvaston Park Group of Friends for inviting us to help out. The following article by reporter Chris Jones and containing photographs by Ian Hodgkinson appeared in the Derby Telegraph on Monday, 14th January 2013.